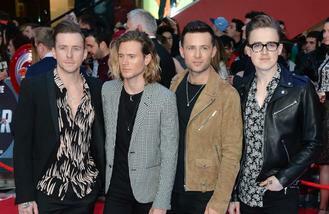 The boy band, which is comprised of Tom Fletcher, Danny Jones, Dougie Poynter and Harry Judd, joined forces with Busted last year to form McBusted but have since made a return without the three additional members, and have revealed they feel more open minded than ever before following their collaboration. Speaking to Digital Spy, the band's guitarist Fletcher said: "I genuinely feel that, because there's been such a gap and because of McBusted, this is the first time that I feel completely refreshed with McFly. "When we go into the studio, I want it to be with a completely fresh, open mind." And the group believe they have come to a point in their career where they don't feel any "pressure" to produce a certain genre of music or "a particular sound". The 31-year-old singer continued: "There's been such a big gap between McFly's albums, that now we're at the stage where we're not tied down to a particular sound. "There's enough of a line drawn that we could come back with whatever sound we want. For the first time, there's no pressure or musical expectations on us that could limit us or dictate where we need to go. "I hate the idea of having to conform with what's current and what sounds good on radio at the moment." And the '5 Colours in Her Hair' hitmakers - who first formed in 2003 - are excited for their future and believed their next LP will be "the best album" of their career. Fletcher - who married his wife Giovanni in 2012 and has sons Buzz and Buddy together - explained: "There's something really exciting about that and if we can get our heads in the right place and pull together, it's totally possible for us to make the best album of our career."